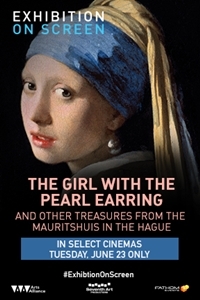 Fathom Events, Arts Alliance, and Seventh Arts are elated to bring the Girl with a Pearl Earring and other treasures from The Mauritshuis in The Hague to select cinemas nationwide on Tuesday, June 23. This one-night event pursues the many unresolved riddles surrounding the extraordinary painting and its mysterious creator Vermeer. Who was this girl? Why and how was it painted? Why is it so revered?